Steal three specific valuable items from a wealthy house. Talk to Vex in The Ragged Flagon about sweep jobs. Enter the targeted house and steal the items she names. Return them to Vex for a reward. After joining the Thieves Guild, Vex will tell you that she handles all the burglary, shill, sweep, and heist jobs. Ask her for a sweep job and she will inform you that one of Skyrim's citizens has three items that the guild covets. The quest can send you to any wealthy house in the game, which amounts to 29 possible houses. You may be assigned the same location more than once. 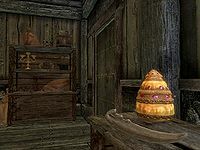 You must not be caught and sent to jail while the quest is active, for any reason, otherwise you will fail the quest; you also cannot kill anyone living in the house. If one of the house's occupants dies for any reason while the quest is active (even if you are not responsible), you will fail the quest. One of the three items appears in the same location as where the item for The Burglary Job is placed. The only effective difference between this quest and The Burglary Job is that this quest requires two additional items to be stolen from the house. If you have already participated in the quest Battle for Whiterun it becomes impossible to enter some homes in Whiterun (the entrance to Heimskr's House is always blocked, while others should clean up after some time has passed). However, they can still be assigned as a possible quest destination. Quit the job and retake it for another location (you can load a previous save to avoid a failed quest if you wish). You can use the console command coc, followed by the editor id of the house. If you cancel a sweep quest, the items don't disappear from the house which can cause some overlap problems if the quest is assigned to that house again. If a jeweled goblet is a target and a golden urn was previously placed, the goblet will be unable to be picked up. You can use the console command MarkForDelete, then target the golden urn, this should reveal the jeweled goblet. 200 Finishes quest I've successfully completed the job and received my share of the pay. 250 Fails quest By killing a resident at the task's location, I've failed this job and was forced to forfeit my share of the pay. Fails quest During the course of this task, I was arrested and sent to the local jail. I've therefore failed the job and was forced to forfeit my share of the pay. The following empty quest stages were omitted from the table: 5. On the PC, it is possible to use the console to advance through the quest by entering setstage TGRHC stage, where stage is the number of the stage you wish to complete. It is not possible to un-complete (i.e. go back) quest stages, but it is possible to clear all stages of the quest using resetquest TGRHC. This page was last modified on 24 October 2018, at 06:49.